Vintage and Antique Mirrors: The Hall of Mirrors doesn’t only have to exist in the Palace of Versailles. 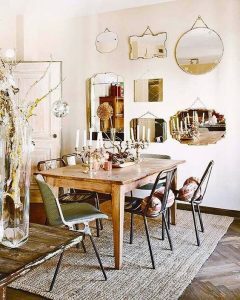 Create your own wall of mirrors with vintage and antique mirrors. If the frame around the mirror is too worn out, spray paint them another color, perhaps something bright and fun to balance out the vintage vibe. 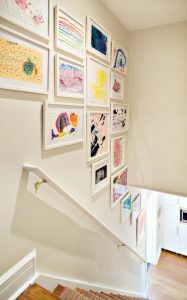 Kids’ Artwork: If you have kids or even grandchildren, you probably have admired over their unique drawings and paintings. Why not frame them? They’re bright, colorful, and one of a kind. 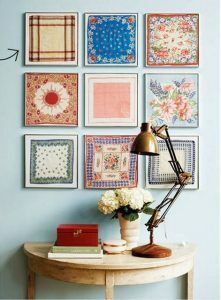 Polaroids: Don’t tuck away your Polaroid pictures in an album, display them on your wall! 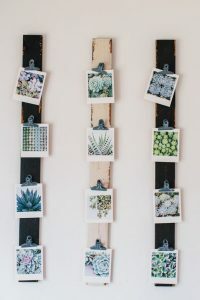 Attach bulldog clips to the wall with sticky tack to create a gallery wall with Polaroids. The best part of it all, it’s quick and easy to change out the photos. 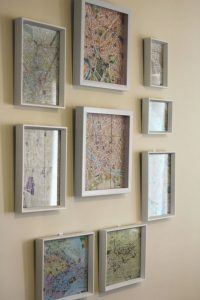 Maps: If you love traveling or just love maps in general, you might want to consider framing and displaying your collection of maps. Maps of places that you’ve been to or places you love, from countries to cities or even the New York subway map or a national park map, the options are endless! Same Frame, Same Size, and Black and White: If you like the more uniformed, clean, and sophisticated look, then you will love this idea. Each photo, no matter what it is, family, friends, pets, vacations, etc. is black and white, the same size, and in the same style of frame.